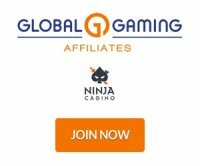 The affiliate program has changed to Lucky Partners. GSS Affiliates is the casino affiliate program for VA Bank Casino. The casino is available in English and Russian languages and targets these players plus players from the United States. The casino software is called Globo Tech and the casino's license is in the Netherlands Antilles. Affiliates have 2 different types of revenue share to choose from: 50% revenue share which is based on player losses or 20% deposit share which is 20% commission on the deposit regardless if the player wins or loses. Affiliates can sample some of the banners available on the affiliate website. The program gives affiliates many animated gif banners to use as well as text links to promote their VA Bank Casino. Affiliates have a very generous commission rates to choose from whether 50% revenue share or 20% deposit share. They don't seem to have the standard payment methods but you can get paid using Webmoney.